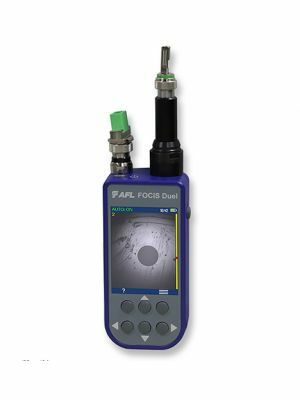 FOCIS Duel is a self-contained twin-ported Bluetooth connected fiber optic connector inspection probe with integrated screen. The first port (right hand side Port 1) is fully featured, identical to AFL's FOCIS Flex. The second port (left hand side Port 2) has fast and convenient female "click-in" adapters, auto-focus and 2X zoom capabilities. The FOCIS Duel can perform IEC, IPC, AT&T and user-defined end-face cleanliness analysis and store Port 1 images and reports locally. The AFL FOCIS App (iOS and Android) provides a comprehensive and user-friendly feature set as well as connectivity with AFL's cloud-based aeRos® workflow automation platform.